New research reveals more than one in ten (11per cent) think it is likely they will be offered redundancy in 2019*. More than a third (38 per cent) of UK employees view redundancy as a threat with a quarter (25 per cent) saying reducing their monthly spending would be one of the first things they would do if they were to lose their job. Certainly many immediately see the negatives of a possible redundancy. However, Lee Hecht Harrison Penna, who work with more than 20,000 people made redundant each year, say many also use redundancy to make a positive change in their lives and careers. 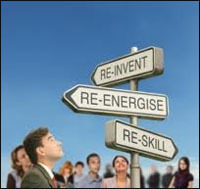 Which industries are expecting redundancy? According to Lee the research, IT workers are the most expecting redundancy, with three in ten (30 per cent) thinking they will be let go this year. Over a quarter (27 per cent) of building and property workers fear redundancy, with 22 per cent of engineering workers and 21 per cent of hotel, leisure and entertainment employees also expect redundancy. Despite the well-reported High Street woes, retail and wholesale staff feel relatively secure with only seven per cent fearful of redundancy this year, perhaps thinking the worst of the trend is behind them. Meanwhile British emergency service workers also feel secure in their roles with only 5per cent thinking redundancy is a possibility in the next 12 months. However, redundancy rates are currently at a record low, according to the ONS. The survey shows some workers see redundancy as an opportunity, with almost three in ten workers (2 8per cent) saying they would explore jobs outside their current sector if made redundant. HR can play a crucial role helping employees move on effectively. It is important employees are supported through the process to ensure their wellbeing and successful transition to new roles. Companies and businesses that handle this process well can protect their brand and ensure workers leave with a positive experience. While redundancy can be extremely unsettling and cause stress and fear for many workers, it can also be the chance to take some time to assess career goals and make sure you are on the right track. Redundancy can present a great opportunity to explore new prospects in an industry you are passionate about or supercharge your professional development in a different organisation. A useful first step for individuals facing redundancy is to get an external perspective and reflect on the positive and negative aspects of their past jobs and the suitability of previous roles to their strengths and weaknesses. There may be a career that is more suited to their skillset and interests, or one they have always wanted to try but never had the impetus or chance to switch careers and pursue a new path. This can be the chance to refocus your career goals, expand your personal and professional network and be proactive about taking charge of your job search. With this approach it could be the start of a fulfilling new career. Pingback: How Does Cystic Fibrosis Affect Our Fear of Failure?